In the early 1980s, just as I was getting seriously interested in music, electronic musical instruments were getting seriously interesting and affordable. I spent a lot of time lurking around the back section of music stores and even home organ stores (yes, they used to have such places; do they still?) fiddling with the then brand-new Roland Juno and Jupiter 8 synthesizers, wonderstruck by their sounds and excited by where they might take music. These instruments were, of course, really just elaborate keyboards, but oh, they were so much more besides: gateways to new soundworlds and tactile introductions to sound synthesis (remember: these synthesizers were full of knobs and sliders that allow users to shape sounds beyond presets). 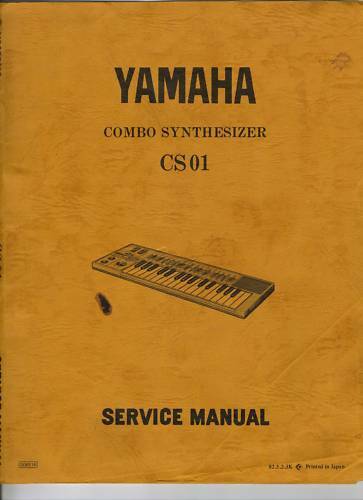 In 1982, Yamaha released a portable monophonic analog synthesizer called the CS-01 (part of their Producer Series which included a headphone amp, mixer, and headphones) which I received as a gift from my parents. Miniature as it was, the CS-01 was a full-blown synth complete with waveform selector, ADSR envelope, frequency modulation, octave selector, and a few other capabilities too. I loved it for its otherworldly vibe and it was my introduction to electronic music. Somewhere in my archive of home recordings I have a medium quality chrome cassette tape or two full of my low-fi experiments with the Yamaha and Synsonics technologies. Since I’m sparing you listening to those recordings I’ll describe the kinds of things I did most often: play a mono lead on the synth while playing a left hand bass part on the piano to the white-noise accompaniment of the Synsonics chugging away in 4/4 (amplified through my boom box). Sometimes I would take a recording like this and play it back on my boombox, play along with that recording, and record the two sound sources onto another cassette machine. It was primitive overdubbing technique for the era, to be sure, but it served my purposes well. At the time, my personal music culture was orbiting fairly intensely around 1980s synth pop, so perhaps it’s no surprise that as I type these words I began hearing those sounds again in my mind’s ear. But wait! The music I’m hearing is actually very recent–from 2009 in fact. If you listen to English duo La Roux’s song “In for the Kill” you get a very authentic rendering of that early 1980s stripped-down synth pop soundworld that I once inhabited. And take note: La Roux were born in the late 1980s–right around the time I had retired the CS-01 and the Synsonics from my toolbox. So today’s lesson: you never know when a set of “outdated” sounds will make a return to the social life of music . . .